Hibiscus rosa-sinensis, known colloquially as Chinese hibiscus, China rose, Hawaiian hibiscus,, rose mallow and shoeblackplant, is a species of tropical hibiscus, a flowering plant in the Hibisceae tribe of the family Malvaceae. It is widely cultivated in tropical and subtropical regions, but is not known in the wild, so that its native distribution is uncertain. An origin in some part of tropical Asia is likely. Hibiscus rosa-sinensis was named in 1753 by Carl Linnaeus in his Species Plantarum. The Latin term rosa-sinensis literally means "rose of China", though it is not closely related to the true roses. The root is a branched tap root. The stem is aerial, erect, green, cylindrical and branched. The leaf is simple, with alternate phyllotaxy and is petiolate. The leaf shape is ovate, the tip is acute and margin is serrated. Venation is unicostate reticulate. (Venation is branched or divergent.) Free lateral stipules are present. Epicalyx are present, valvate aestivation, free. Calyx are gamosepalous, valvate, sepaloid. Corolla are polypetalous, twisted, petaloid. Indefinite stamens, monoadelphous. Gyanoecium pentacarpellary, ovary superior, placentation axile, syncarpous. It can bloom all year round. Despite its size and red hues, which are attractive to nectarivore birds, it is not visited regularly by hummingbirds when grown in the Neotropics. Generalist species, like the sapphire-spangled emerald, Amazilia lactea, or long-billed species, like the stripe-breasted starthroat, Heliomaster squamosus, are occasionally seen to visit it, however. In the subtropical and temperate Americas, hummingbirds are regularly attracted to it. The endangered Papilio homerus butterfly, the largest in the western hemisphere, is known to feed on the nectar of the Hibiscus. 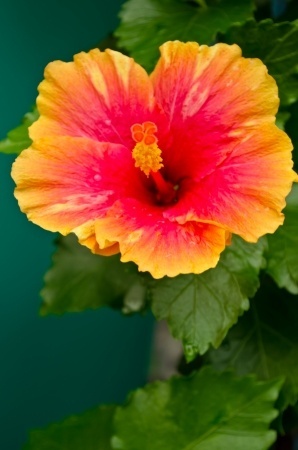 Hibiscus rosa-sinensis is one of many plant species with a genetic characteristic known as polyploidy, in which there are more than two complete sets of chromosomes, unlike most other species. A side effect of polyploidy is a condition where the phenotype of the offspring may be quite different from the parent, or indeed any ancestor, essentially allowing possibly random expression of all (or any) of the characteristics of all the generations that have gone before. Because of this characteristic, H. rosa-sinensis has become popular with hobbyists who cross and recross varieties, creating new named varieties and holding competitions to exhibit and judge the many resulting new seedlings and often strikingly unique flowers. The flowers of Hibiscus rosa-sinensis are edible and are used in salads in the Pacific Islands. The flower is additionally used in hair care as a preparation. It is also used to shine shoes in certain parts of India. It can also be used as a pH indicator. When used, the flower turns acidic solutions to a dark pink or magenta color and basic solutions to green. It is also used for the worship of Devi, and the red variety is especially prominent, having an important part in tantra. In the Bengal area of eastern India, the red variety of this flower is used to worship Devi Kali. In Indonesia, these flowers are called "kembang sepatu", which literally means "shoe flower". In several countries the flowers are dried to use in a beverage, usually tea. It is widely grown as an ornamental plant throughout the tropics and subtropics. As it does not tolerate temperatures below 10 °C (50 °F), in temperate regions it is best grown under glass. However, plants in containers may be placed outside during the summer months or moved into shelter during the winter months. Numerous varieties, cultivars, and hybrids are available, with flower colors ranging from white through yellow and orange to scarlet and shades of pink, with both single and double sets of petals. The cultivar 'Cooperi' has gained the Royal Horticultural Society's Award of Garden Merit. The word bunga in Malay means "flower", while raya in Malay means "celebratory" or "grand". The Hibiscus rosa-sinensis is literally known as the "celebratory flower" in Malay. The red of the petals symbolizes the courage, life, and rapid growth of the Malaysian, and the five petals represent the five Rukun Negara of Malaysia. The flower can be found imprinted on the notes and coins of the Malaysian ringgit. Cultivars with flowers of many colours are used as ornamental plants. Some are double or have differently shaped petals.